The minute this question is asked, I often find my mind thinking more about what the kids are going to do to ‘show what they know’ then the how they are going to develop their understanding. It’s like the summative assessment task is the monster that ate inquiry. It can be easy to blame this state of affairs on the nature of summative assessment. It’s a final, set in stone, and we’ve got to have one because it’s in there in the PYP planner. 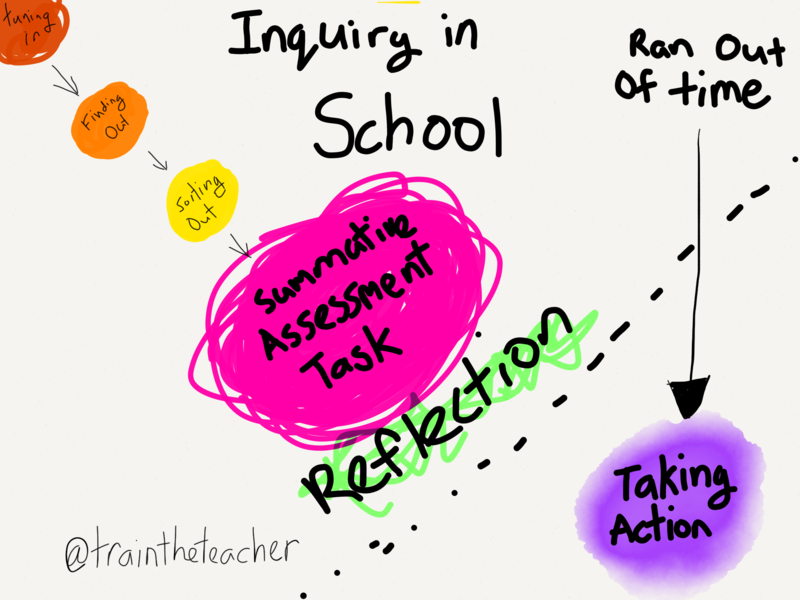 Which leads me to wonder – what actions am I taking (or not taking) as a teacher that feeds the summative assessment monster? Planning the task too soon – If we’re serious about inquiry, then we need to spend time gauging the children’s own understanding and their interests before thinking about how the children will demonstrate a growth in their understanding. Not using formative data- Often summative tasks are drawn up without any reference by children and teachers to the learning and checks for understanding that are regularly happening in classrooms. Trying to assess too much – in planning to assess all five elements of the PYP in one task, there’s a tendency to plan more elaborate tasks that end up not assessing much at all. A focus on doing – ‘Finishing the poster/presentation/writing/movie’ becomes the destination of the unit, rather than a tool for measuring growth of understanding during the unit. One size fits all task– Often summative tasks ends up with everyone ‘doing’ the same thing. I’ll never forget taking a quick glance at a child’s poster and thinking he had a limited understanding. As I listened to his Doodlecast, he showed so much more. Assessing the wrong thing – a presentation is going to demonstrate a child’s ability to present not their understanding of push and pull factors of migration. A written task, shows off their writing capability not their understanding of how energy is transformed and transferred. Document, document, document – if children and teachers are looking for shifts in understanding, then there should be a comparison from the beginning to the end. Use the documentation – The different between a check for understanding and activity comes down to how the data is used. The difference between a pretty wall display and a performance of understanding comes down to how the data is used. Understanding might be shown in different ways – the kid playing with the science equipment might actually be showing off an understanding of scientific process – meanwhile the poster might be showing off procedural writing. Simplify the task in the current unit of inquiry into how humans use fashion to express their beliefs – it was easy to dream up a task where kids made elaborate wearable art and have a fashion show. Yet the better task would be for the children to contrast their decision making of their ‘free choice’ fashion day at the start of the task with their decision making at their mufti day at the end of the unit. Change the task to fit the learning, not the learning to fit the task – the task at the end of the unit might look very different from the one you had in mind at the beginning. It’s an example of letting the regulations drive the planning that the IB needs to address in the review. Backward design requires us to know where the learning is going so we can plan how to get there. It doesn’t have to be a task. Once we establish our conceptual understanding rubrics, we know our goal can be for students to demonstrate those understandings in any way at all. We don’t always plan a summative task.. Besides, if the teacher needs a task at the END of the unit to tell her what the student has understood, it is too late to do anything about it. I think you hit the nail on the head. It’s in the planner so we must – is where the monster starts and then it just builds on from there. Your post raises some pertinent issues and I too have often found teachers lay too much emphasis on the summative more than the formative process of learning! If we as teachers make a very concious effort to understand that the summative is a continuous ‘learning engagement’, from the beginning of a unit, I think we should get there. Also the emphasis putting the summative in the planner before the unit begins has always been ‘Scarry’! Reblogged this on SMCC Sunsprint Challenge. Your summative assessment addresses the central idea. That’s it. You should always have your summative assessment designed before you begin teaching. You need to know where you want the kids to go before you take off on trying to get them there. Your formative assessments measure your lines of inquiry.